Today’s Featured Instagram Account designation goes to Grounds Cafe! This awesome coffee shop is located at Wendell Falls, a Clairemont client. We love the people at Grounds Cafe, and we think they are Instagram superstars! I mean look at that face! What a great shot. 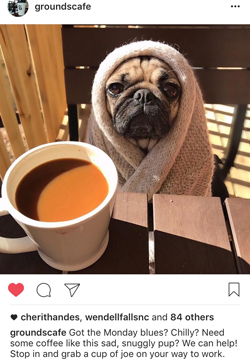 To see other adorable dogs, drool-worthy grilled cheese sandwiches and perfectly prepared lattes, follow Grounds Cafe on Instagram. Wanna know what else we like on Instagram? Check out our post Instagram: 3 Takes on Video Fun.